Strings of Edison bulbs have long been the go-to choice to set a festive, outdoor Parisian mood. For this reception at Santa Barbara’s Bacara Resort and Spa, florist Nina Kincaid of Coco Rose Design played off the property’s gorgeous, tall eucalyptus trees by incorporating abundant garlands of silver dollar eucalyptus accented with clusters of creamy dahlias, garden roses, anemones and mini pink pineapples. But it was the lighting that truly set the romantic ambiance. Candles meandered down the table to create a soft reflective light while overhead Spark Creative’s glass chandeliers shone brightly. 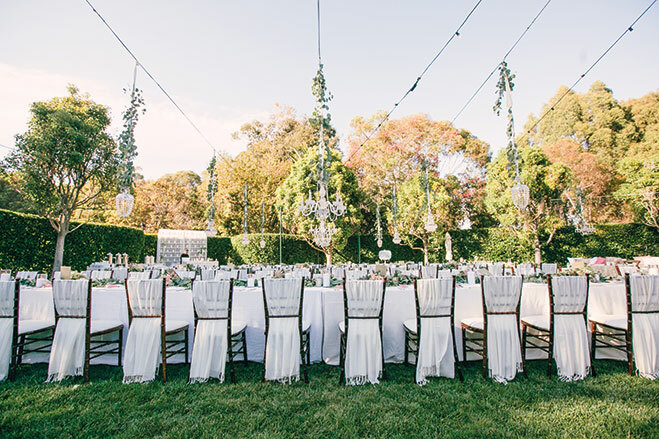 Adding to the lush garden ambiance, the crystal chandeliers were embellished with delicate strands of eucalyptus.